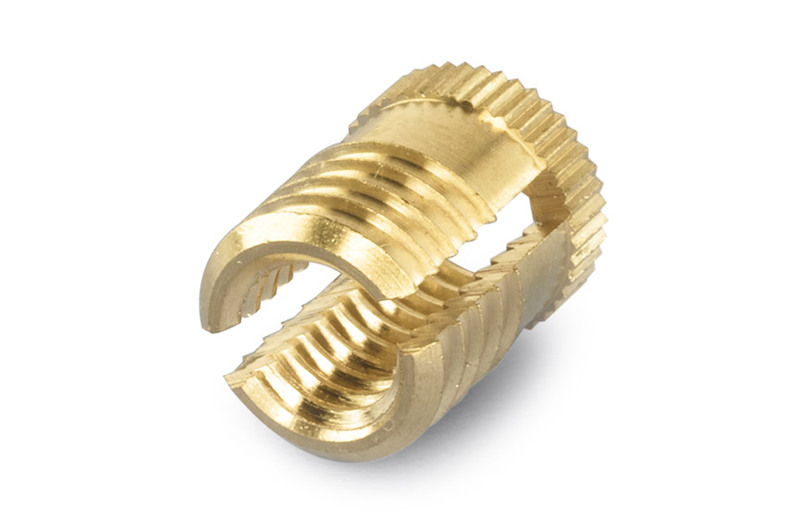 Secure and stress-free anchoring of thread inserts. 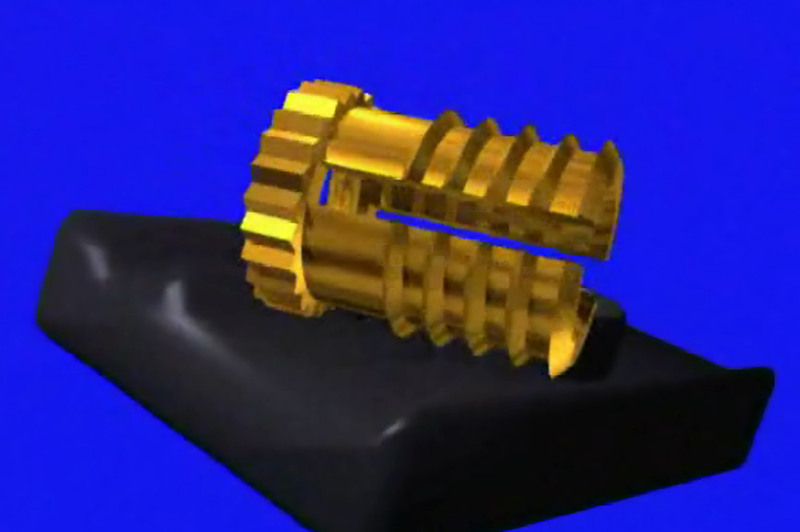 With AMTEC® high-strength thread inserts for plastic parts. AMTEC® stands for “After Moulding TEChnology” and refers to the installation of thread inserts in plastic components after moulding. Today the world of lightweight construction can no longer be imagined without plastics, and they are conquering ever more sectors. Their great flexibility in terms of processing and component design leads to an increasing replacement of metallic materials by plastics. Due to their outstanding mechanical properties, low weight and attractive manufacturing costs, plastics are a fundamental part of industry today. AMTEC® thread inserts make it possible to achieve the advantageous synergy effects resulting from high-strength metals in combination with plastics. 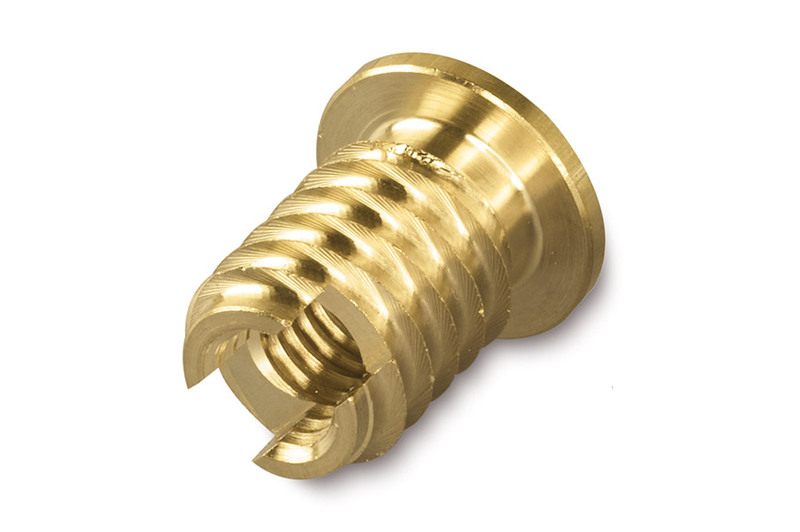 AMTEC® thread inserts have been specifically designed for after moulding installation. The result: a wear-free, high-strength thread in your high-quality plastic components. High pull-out and torsion values. Based on the use of heat, a tight fit with low stress during cooling results. Top quality despite cost savings. Thread inserts from AMTEC® have been specifically designed for after moulding installation. The result: a wear-free, high-strength thread in your high-quality plastic components. Heat element welding is a tried and tested joining technique to embed metal thread inserts into thermoplastic mouldings. During the single-phase process, contact heat is transferred to the joining zone of the plastic via the metal insert. Joining takes place on fusion of the plastic at the contact surface. During this process, the plasticised mass is forced into specific recessed areas and undercuts to produce a form-closed joint. 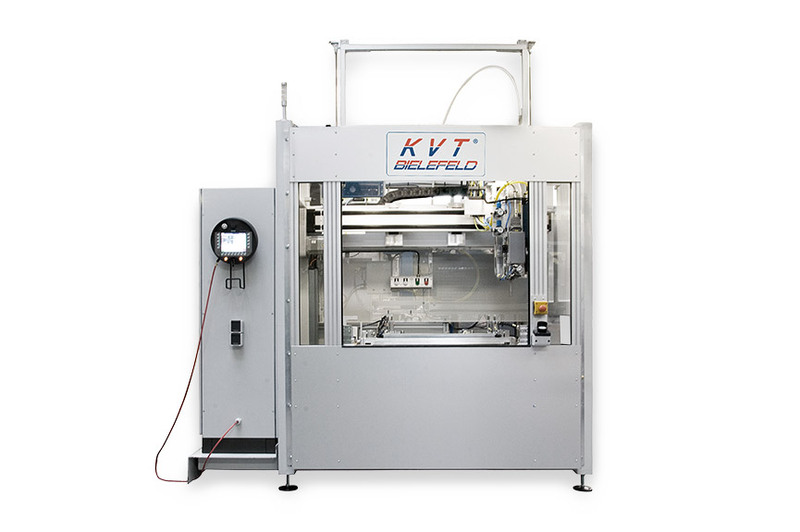 ERW (electromagnetic resistance welding) is a technique developed by KVT Bielefeld for the joining of metal and thermoplastics. An electromagnetic AC field heats the thread insert without contact and the contact surface of the plastic component is plasticised. During the simultaneous joining process, the melted material is forced into recessed areas and undercuts. USW is a process that was originally developed for joining thermoplastic parts. Within a very short time, the plastic material is plasticised by boundary-layer friction and vibration absorption of the parts to be joined. This is followed by the joining process. The necessary energy is generated as alternating voltage in the ultrasonic generator, converted into mechanical vibration (20 – 40 kHz) and then introduced with a sonotrode. With the embedding of thread inserts (metallic M 2 – M 6) in the thermoplastic material, the melted material is forced into recessed areas and undercuts. HITSERT® 2 thread inserts are specially designed for thermal installation. 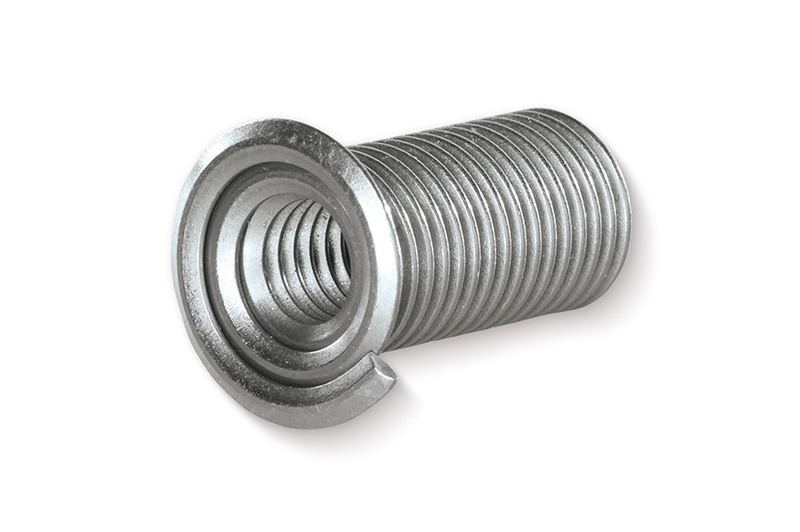 They are available in various versions with nut and bolt threads. 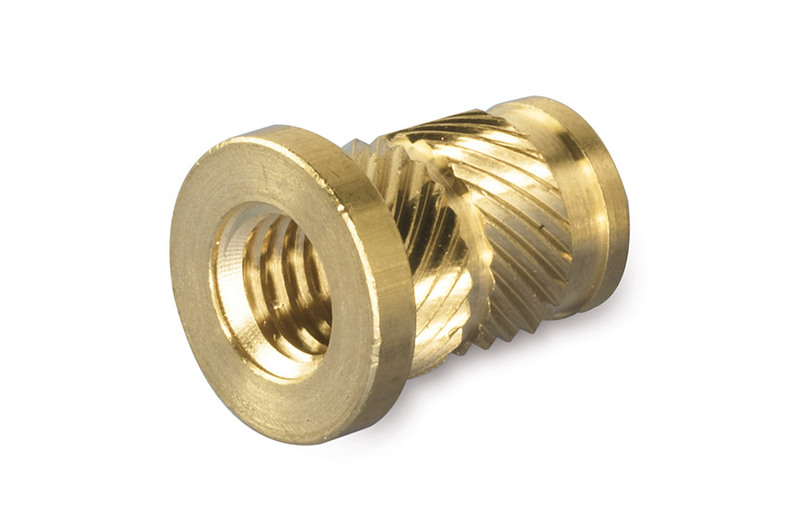 The HITSERT® 2 thread insert is heated to the melt temperature of the plastic. Through the heat transfer during insertion, the plastic is briefly plasticised and flows into the undercut and knurling of the thread insert. Cooling then results in a tight fit with low stress.. The HITSERT® 3 is a tapering universal insert for thermoplastics. 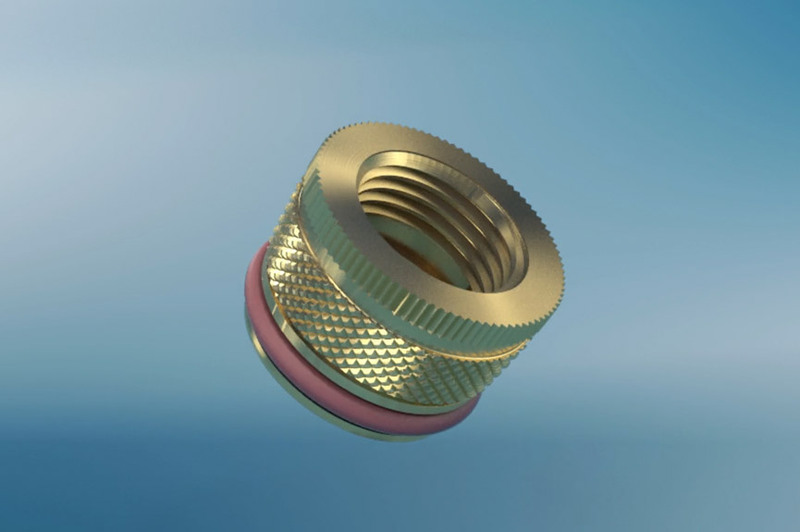 Owing to its patented external contour (characterised by a fine, self-tapping thread with an asymmetric flank profile), HITSERT® 3 is the first thread insert to be suitable for the complete range of well-established installation methods. QUICKSERT® thread inserts are designed for self-tapping insertion and are available with and without a flange. 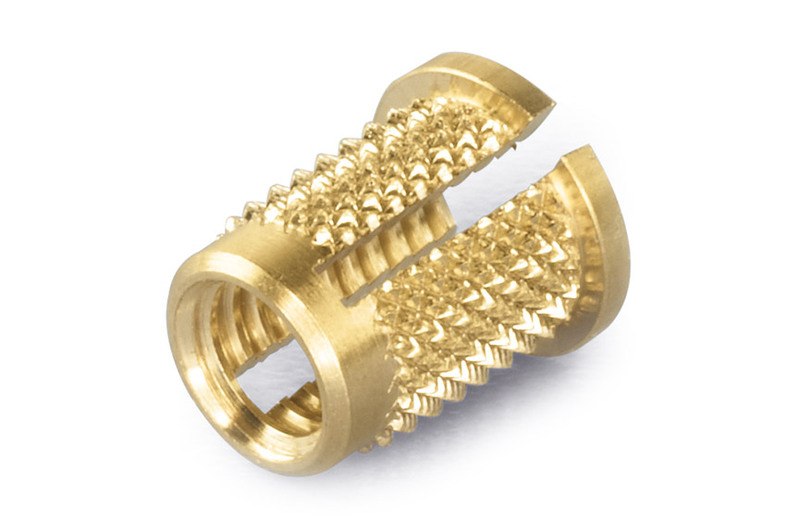 The QUICKSERT® consists of a cylindrical body with an internal thread and a special external thread. The external thread profile has an extremely small flank angle and increases asymmetrically to the root of the thread. This optimises installation with low driving torques. Very good tight fit is achieved with an ideal distribution of load. The lower part of the bush is provided with a cutting slot. The thread bush is screwed in with a rotating spindle. QUICKSERT® Hex thread inserts are designed for self-tapping insertion and are available with and without a flange. 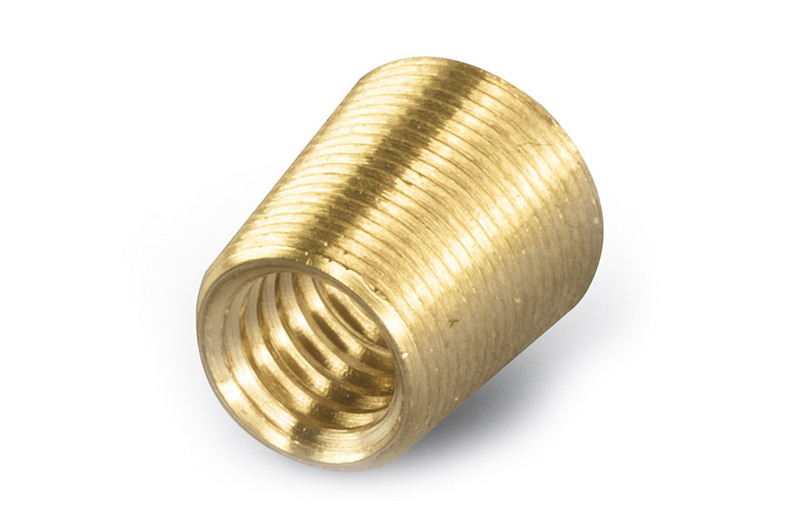 The QUICKSERT® Hex consists of a cylindrical body with an inner thread, internal hexagon and a special external thread. The external thread profile has an extremely small flank angle and expands asymmetrically to the thread root. Assembly is thus optimised with low screw-in torques. With ideal load distribution, a tight fit is ensured. The bottom part of the bush has a cutting slot. The thread bush is inserted and screwed in with a rotating spindle, which does not have to be screwed out. Efficient installation process due to additional drive feature (e.g. internal hexagon). 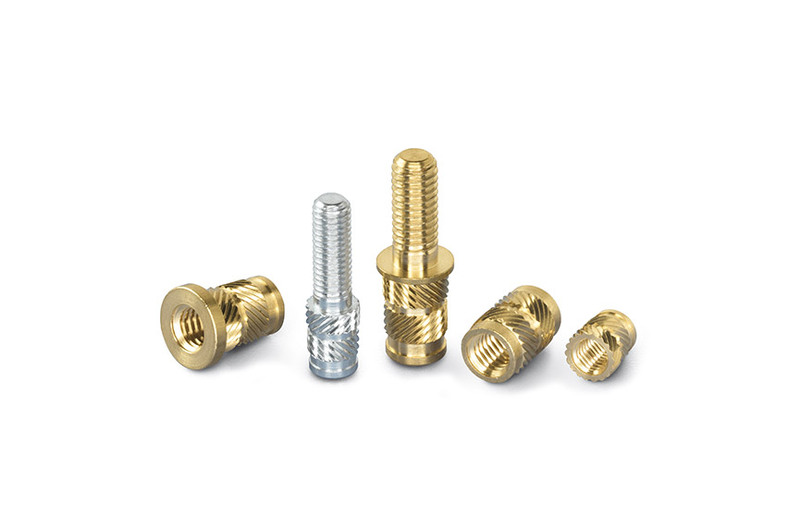 QUICKSERT® Plus thread inserts are designed for self-forming insertion and are available with and without a flange. 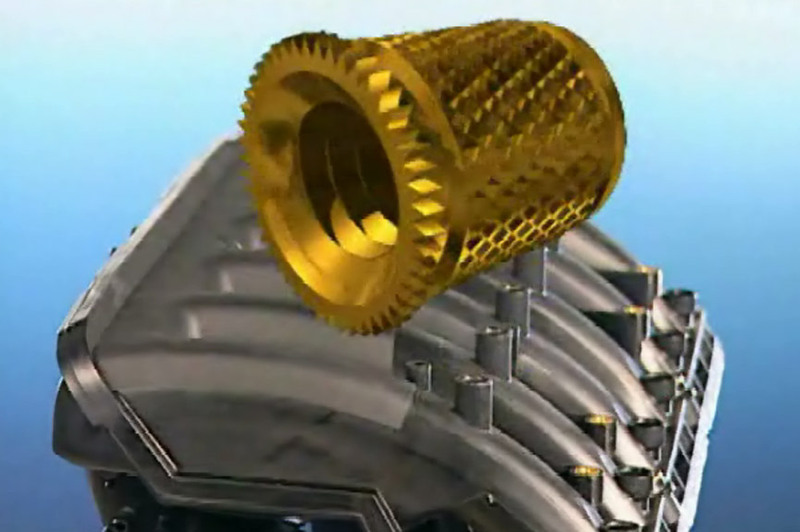 The QUICKSERT® Plus consists of a tapering body (overall taper 8°) with an internal thread, additional internal hexagon and a special external thread. The external thread profile has an extremely small flank angle and increases asymmetrically to the root of the thread. Driving torques for installation are thus reduced. With ideal load distribution, a tight fit is ensured. Since no cutting slot is needed, no chip is produced because the thread insert moulds itself into the plastic. The thread bush is inserted and screwed in with a rotating spindle. 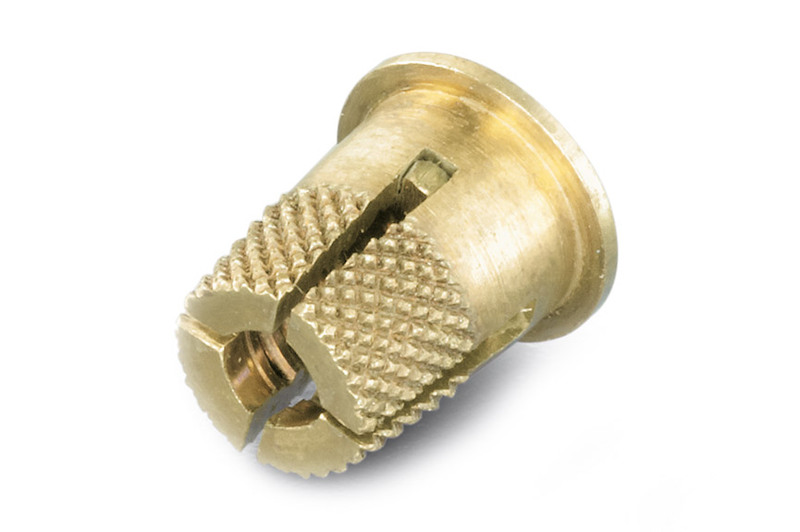 EXPANSIONSERT 1 universal thread inserts are designed for expansion anchoring with thermoset and thermoplastic parts. 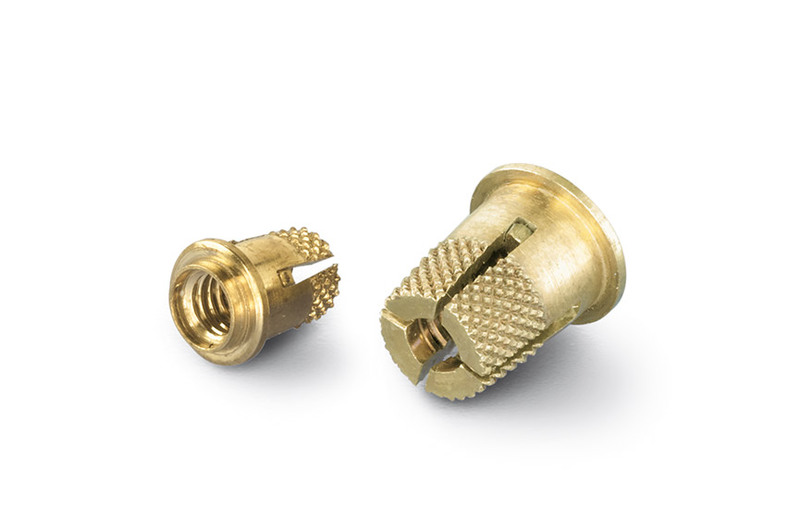 The EXPANSIONSERT 1 thread insert consists of a cross-slotted body with an internal thread featuring external diamond knurling, as well as a spreader plate. On installation of the thread insert in the mounting hole, the diamond knurling is expanded by the spreader plate, which is pushed down. The knurling then anchors itself in the wall of the hole. 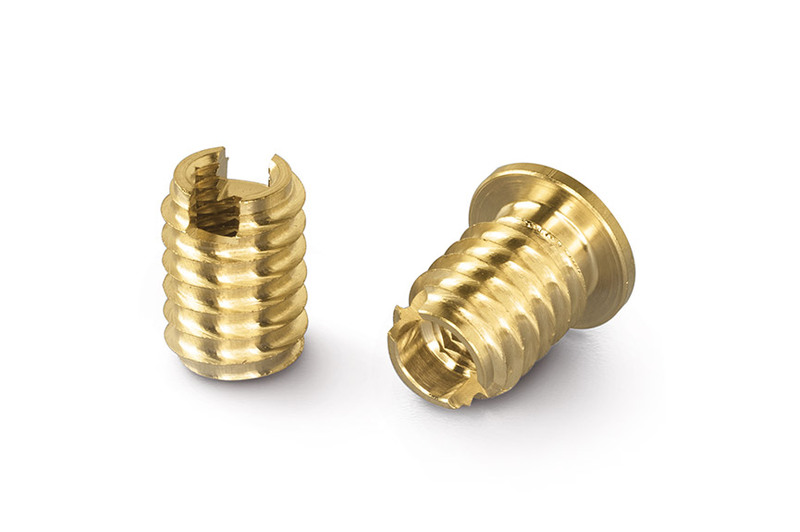 EXPANSIONSERT 2 thread inserts are designed for expansion anchoring with reactive resins, PUR, elastomers, integral hard foams and wood composite materials. 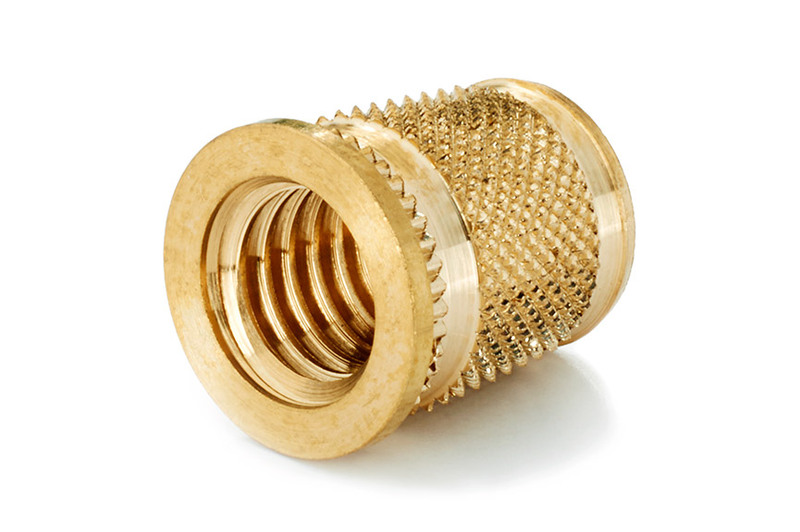 The EXPANSIONSERT 2 thread insert consists of a body with an internal thread that features knurling and undercuts on the lateral surface. 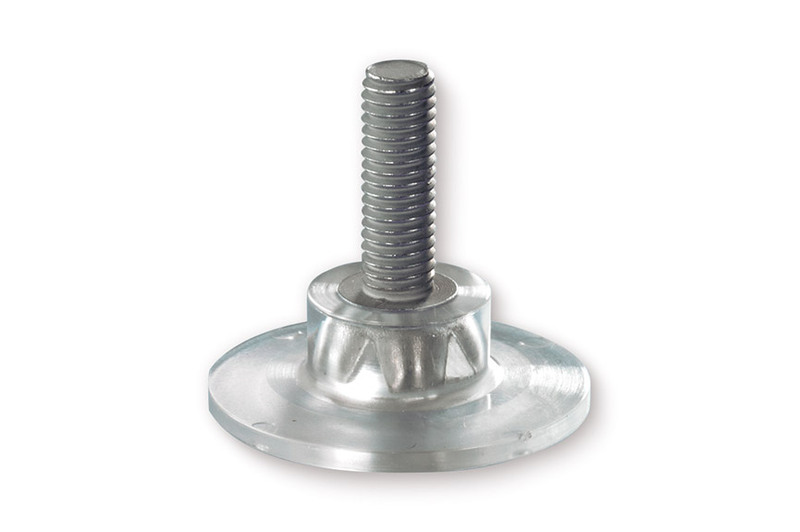 The body contains a spreader plate, which is pushed down into the mounting hole on installation of the thread insert. Upon installation, the slotted bottom part of the EXPANSIONSERT 2 is expanded and its cutting rings are anchored in the wall of the mounting hole. The thread insert is now reliably secured to prevent twisting or pull-out. 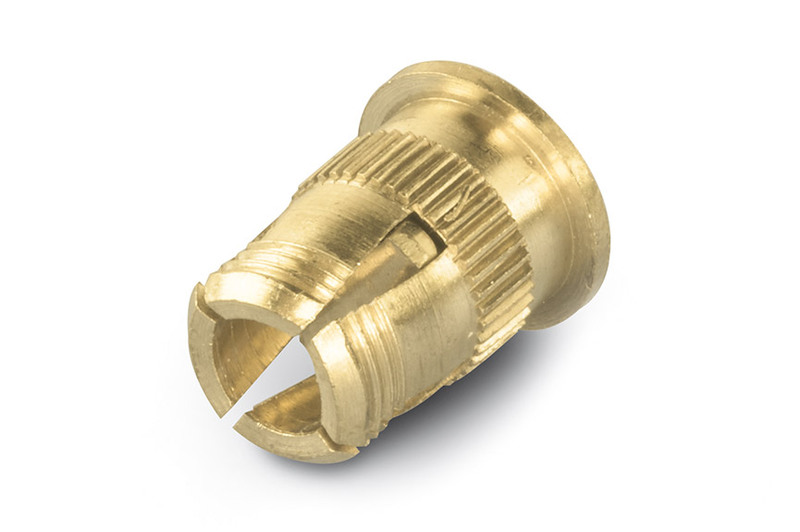 SPREDSERT® 1 thread inserts are designed for expansion anchoring with thermoplastic parts. The SPREDSERT® 1 is inserted into the bore hole until the knurled collar is fully anchored in the plastic. The slotted section is compressed at the same time. 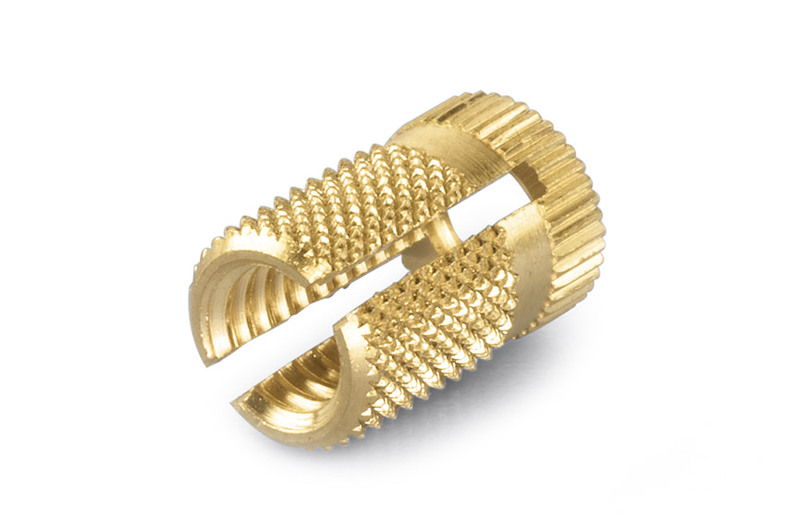 The screw causes the radially secured SPREDSERT® 2 to expand again, the anchor rings penetrate the plastic material and ensure the tight fit of the thread insert. The screw is additionally locked in the process. For the additional expansion force, it is necessary to increase the tightening torque by 10%. 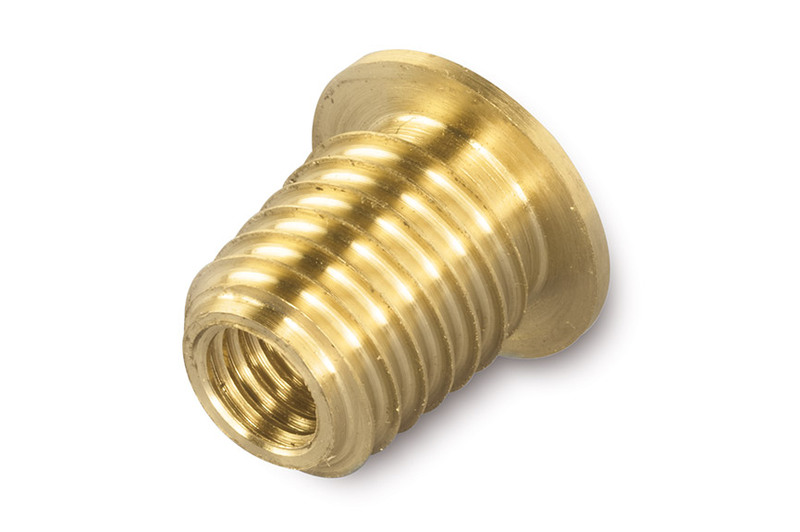 SPREDSERT® 2 thread inserts are designed for expansion anchoring with thermoset parts. The SPREDSERT® 2 is inserted into the bore hole until the knurled collar is fully anchored in the plastic. The slotted section is compressed at the same time. 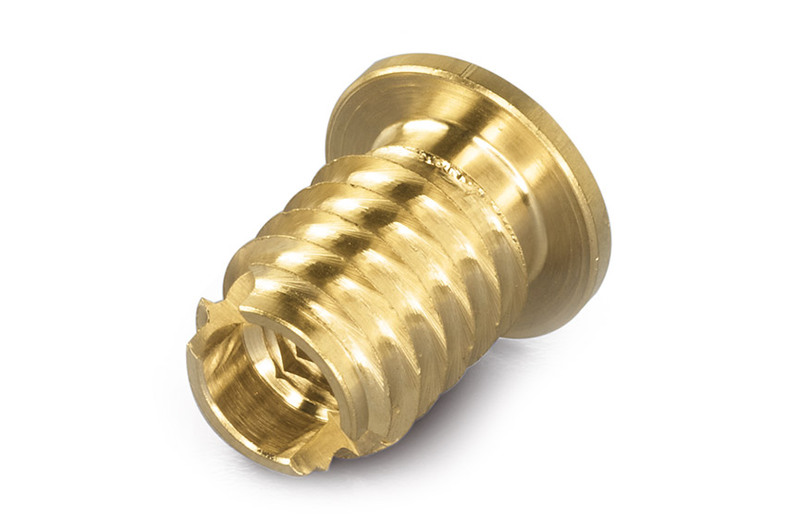 The screw causes the radially secured SPREDSERT® 2 to expand again, the anchor rings penetrate the plastic material and ensure the tight fit of the thread insert. The screw is also locked in the process. For the additional expansion force, it is necessary to increase the tightening torque by 10%. 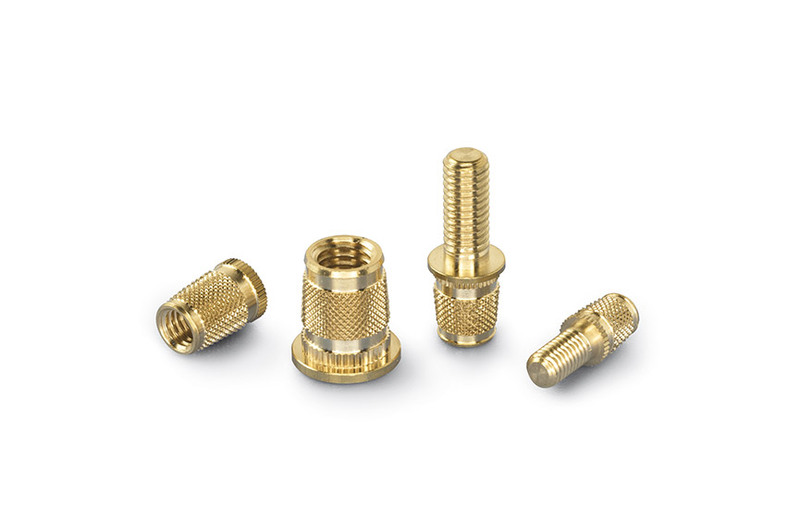 SPREDSERT® thread inserts with a retaining flange are designed for expansion anchoring with thermoset and thermoplastic parts. The SPREDSERT® with retaining flange is inserted into the through hole at the rear until the retaining flange is seated. The slotted anchoring section with diamond knurl is compressed. 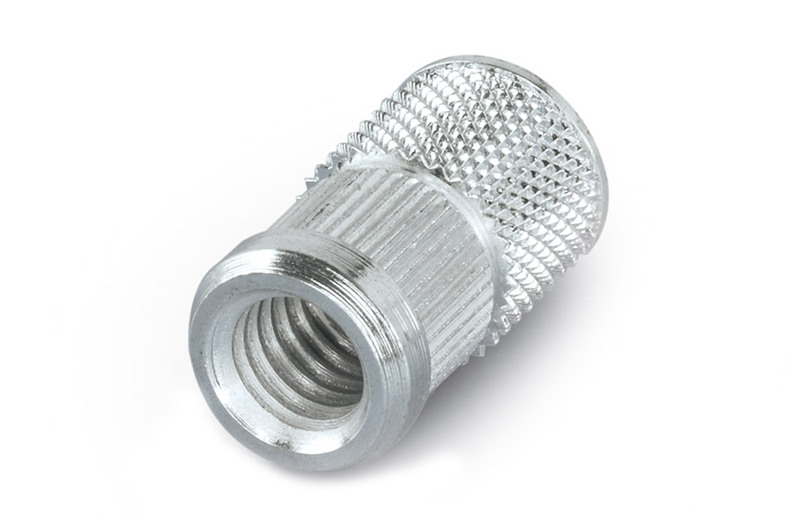 By screwing in the screw, the thread insert is pushed apart in the anchoring section, so that the diamond knurling penetrates the plastic material. Acting as a shoulder support, the retaining flange prevents pull-out. The screw is also locked at the same time. For the additional expansion force, the tightening torque must be increased by 10 %. 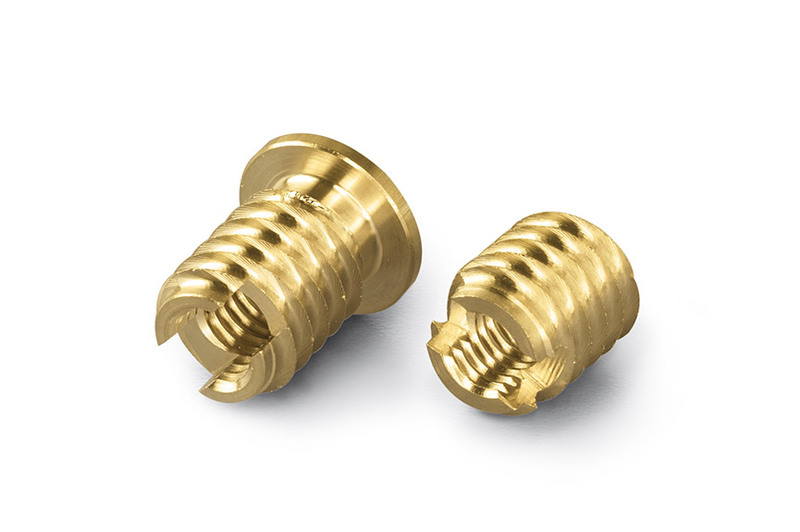 QUICKSERT® Expansion type 1230 thread inserts are designed for expansion anchoring with thermoset and thermoplastic parts. The QUICKSERT® Expansion is spun on to the rotating threaded mandrel of the installation tool and introduced into the mounting hole. This hole may be preformed or created as a blind or through hole using a standard drill. 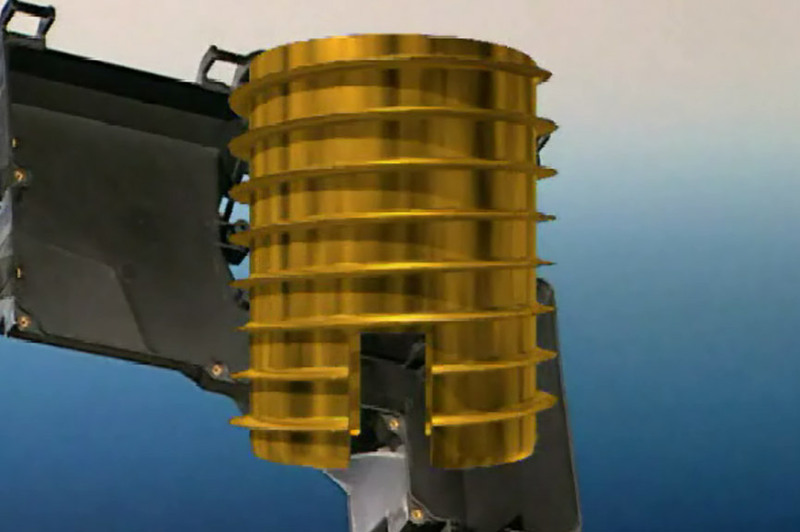 The axial pulling action of the mandrel makes the QUICKSERT® Expansion shear at the predetermined breaking point between the anchoring sleeve and thread bush. The bush is drawn into the anchoring sleeve and expands it. Meanwhile, the diamond knurling of the anchoring sleeve is pressed into the wall of the hole. The thread insert is now securely anchored to prevent twisting or pull-out.